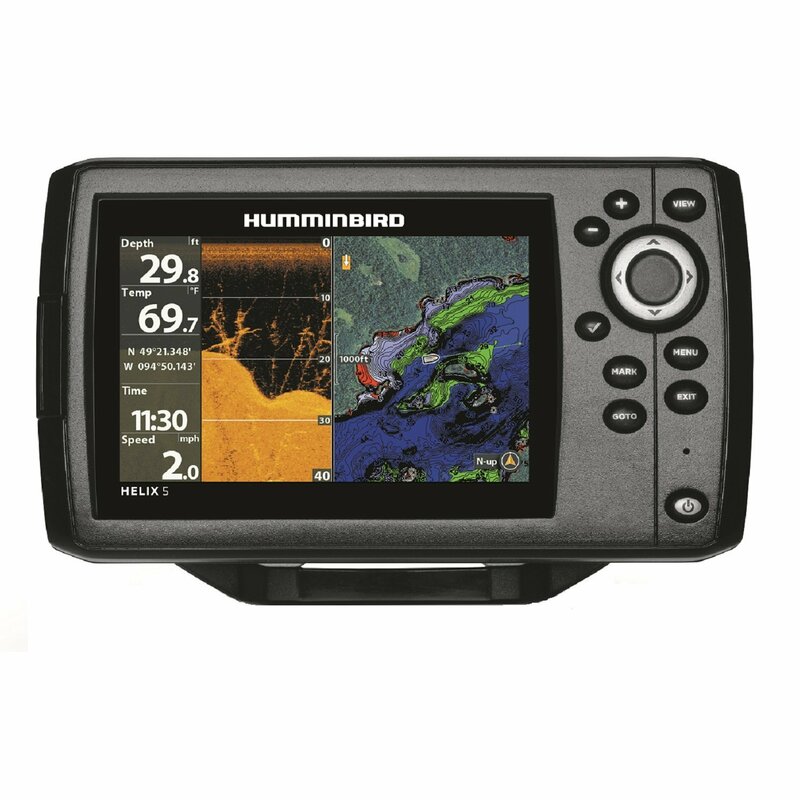 The Garmin 541 | Our an independent review of the Garmin 541 marine GPS chartplotter fishfinder and more on marine electronics. The Garmin 541 is the latest update in this series of Garmin marine GPS chartplotter. The 541 unit ships equipped with a high-sensitivity internal GPS sensor and preloaded Garmin BlueChart g2 U.S. coastal cartography. Also included with the display unit is a power/data cable, protective front cover, tilt and swivel mounting bracket, installation instructions, quick reference guide, and owner’s manual. This unit is also available as the sonar equipped 541s. The pre-loaded chart package coverage includes both U.S. mainland coasts from Canada to Mexico as well as the Bahamas, Puerto Rico, Hawaii, Guam, and the Great Lakes. Auto Guidance and full 3D chart views are available when an optional Garmin Bluechart g2 Vision card is installed in the units single chart card slot. All of the Garmin 5×1-series chartplotters measure 6.4-inches high by 5.9-inches wide and just under 3-inches deep. The series is available with a number of cartography configurations with the middle number in the three digit model designation identifying the specific cartography coverage area: 4 is U.S. coastal, 3 is U.S. inland lakes, 2 is base map only. Two versions in the 5×1-series, the 541 and 521, are capable of interfacing with an optional XM weather and radio receiver and can connect to your vessels NMEA2000 network. All versions have a single chart card slot and can use the Garmin BlueChart g2 Vision card. On our Garmin 541 test unit we found three rear panel ports. The largest is the power/data cable connection, in the middle is the NMEA2000 port, and on the right is a BNC-style connection for an optional external GPS sensor. If you mount the 541 inside a wheelhouse or under a T-top installing an external GPS sensor with a clear unobstructed sky view will optimize GPS performance. This Garmin GPS chartplotter can interface with other compatible marine electronics using one of its two NMEA0183 ports or via a NMEA2000 network. Either of the two NMEA0183 ports can be used to communicate with devices like a VHF radio in normal mode. When configured for the high speed data transfer these ports can communicate with an AIS unit. All 5×1-series machines use a screen with a portrait layout. The 541 screen is 3-inches wide and 4-inches high which equates to 5-inches when measured on the diagonal. It has 320 by 234 pixel resolution and features two color modes named aptly, day and night. The night palette, which can be selected manually or automatically, swaps bright daytime colors for a darker color palette to enhance night viewing. Screen brightness can be set to one of 14 levels using the plus/minus pushbuttons and slider indicator. When viewed from straight ahead with or without polarized sunglasses the screen is bright and easy to read. Very little screen darkening was noted even at extreme viewing angles. No screen fogging was apparent in the display at anytime. Buy this Garmin marine GPS chartplotter here. The Garmin 541 GPS chartplotter uses a seven front panel pushbuttons and a cursor control pad to manipulate onscreen menus. Our test unit was loaded with Garmin software version 3.50. Like all recent Garmin small screen chartplotter reviews we’ve done this one starts you on the Home page. The chart view shows lots of data for the helmsman to steer to a waypoint. From here you can select one of four main pages, Charts, Where To?, Information, and Configure. The homepage can reached anytime from any screen with a quick press of the Home key. The chart choices include a navigation chart, fishing chart, perspective 3D view, and a chart split screen view. The fishing chart incorporates impressive bathometric data while the perspective view shows accurate navigation light displays onscreen. Your next Home page choice is the Where To? menu which includes waypoints, routes, tracks, and offshore services options. The latter supplies the viewer with an impressive list of important service locations like fuel, repairs, food, and more. The Information menu provides access to tide, current, and celestial data as well as other weather data should you have the optional satellite receiver attached or other ship data for those with an optional AIS connected. The last homepage menu choice, Configure, provides the means for you to set a plethora of system and communications preferences. The Garmin 541 can store up to 3000 waypoints and 100 routes with as many as 250 waypoints in each route. Waypoints are identified for the user by choosing one of 70 symbol icons and inserting a name up to ten characters in length. Creating a waypoint at present position is accomplished with a press of the Mark button. Two pages of data are generated for each point. On the first you can then edit, delete, select the point as MOB, or go back to the chart page. The second waypoint data page shows the waypoint location in a chart view. To navigate to a waypoint you select it from the chart page or waypoint list, and then execute the Go To function via onscreen prompts. This puts data boxes up on the chart page with course and distance to the waypoint, plus a course line to steer to the waypoint. Routes can be created from your present position or in another location. Menus selections starting on the Information page lead you through a route creation at another location using the chart or points from the waypoint list. Tide data is displayed graphically as shown. A second page shows data in a table format. The Garmin 541 man overboard (MOB) function on is a two-step procedure. First you need to press Mark button and then you must cursor to the MOB selection and confirm. Once done the unit creates a waypoint, switches to the chart page if you’re not already on it, and opens data boxes giving a variety of navigation data to the helmsman to track back to the MOB position. Even though I’d prefer a one-step procedure the MOB functionality of the 541 is adequate and easy to use and follow. Screen redraws on the 541 are fairly fast. When changing the range step by step on the chart page the screen redraws were smooth and quick when using the pre-loaded chart data. I did not test this unit with an additional chart card installed in the single front panel card slot. This 5-inch Garmin GPS chartplotter uses the same easy-to-use software as most the vast majority of other Garmin chartplotters. I found it easy to use have rated it highly many times in the past in other similar units. The Garmin 541 holds up to tradition and does everything one could ask of it. The 441 is waterproof to IPX7 standards and has a 1-year warranty.